E. had a week in kindergarten which was dedicated to healthy lifestyle. Among others they were talking about (and making a poster about) healthy food. And this bugged my 6,5-year-old daughter. You wonder why? Well, since she was 4 she’s been on a special diet. At that time it turned out she has intolerance towards a lot of food. So food that is considered healthy by the general public cause her serious illnesses, behavioural problems and lack of sleep. Hence she decided to make her own poster. She had been collecting supermarket catalogues, brochures and leaflets and one Sunday I found her seriously cutting in the living-room. At first I couldn’t see the bigger picture and didn’t know what she was into.. Then she explained it so I sat down on the floor and helped her with cutting and sticking. She made 2 posters: Food we can eat and Food we can’t eat (she was responsible for the latter, my task was the former) and sticking and our discussion about foodstuff started. And the result is … WOW! L. is always gets interested in whatever her big sister is crazy about. This time fruit and veggies. Little L.’s attention span is still quite short so the long planting procedure was too much for her. Therefore I decided to make her busy with fruit and veggies in another way. I found this lovely free printable on food at Life over C’s which is a huge pack of several activites. I chose the one in which the child needs to decide the colour of the fruit and veggies on the card. The original activity recommends using clothes pegs to mark the right answer but L. has difficulties in using it all by herself so I decided to give her decor stones of the same colours as she needed to identify. 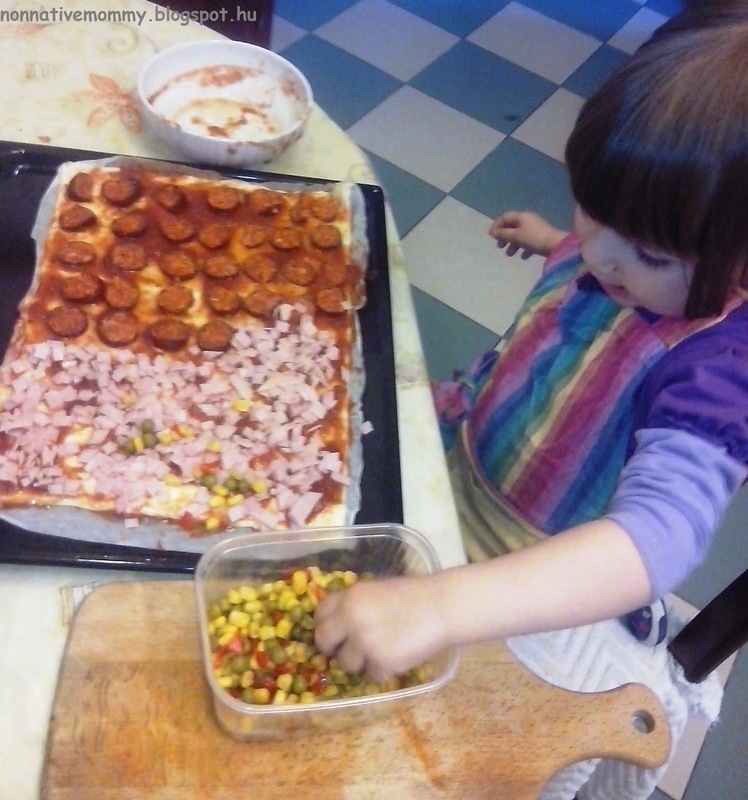 She did this activity with me and with our native nanny too. She enjoyed it so much for quite a long time (8-10 minutes per occasion). After shopping at the market I gave her the real vegetables. She was fascinated to see, touch and even smell them. The pack contains a memory game set. I used it a little differently. 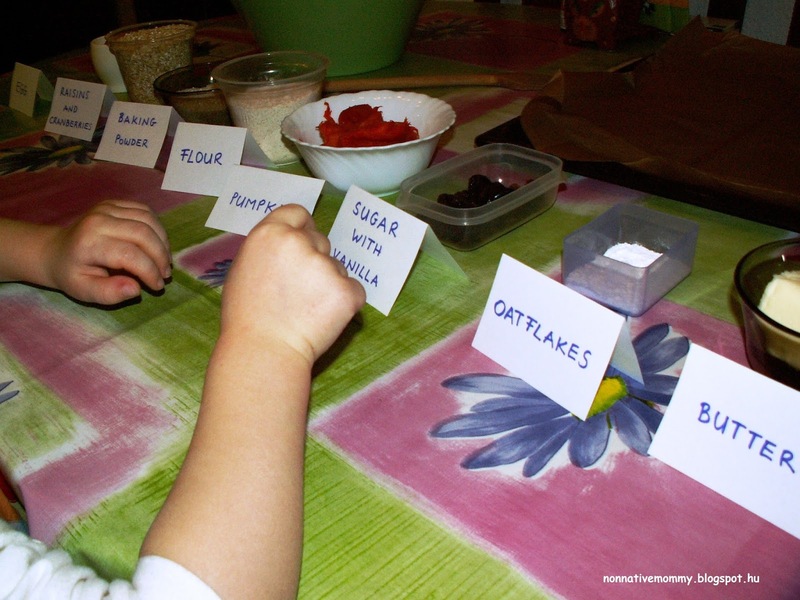 I cut up only the half of the cards and L. needed to recognise and match the fruit and vegetables on the bigger sheet. 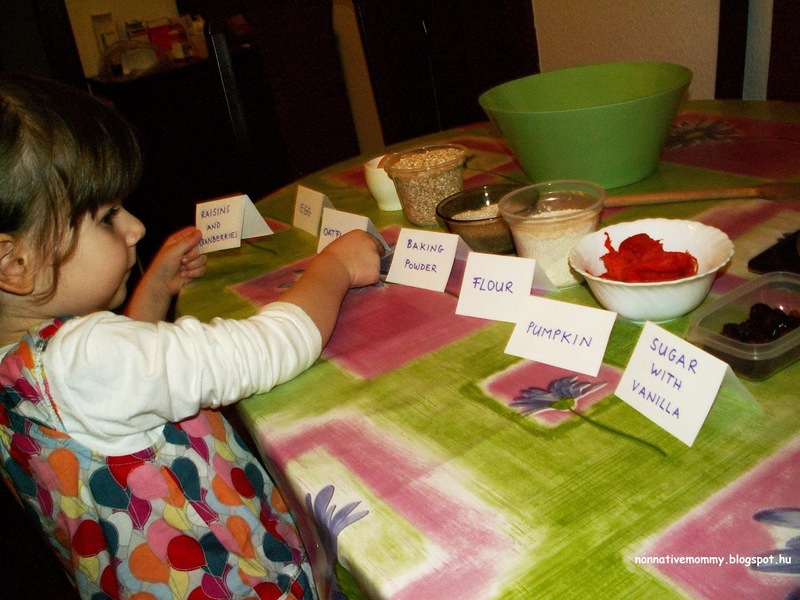 This activity was a hit too, although she is not like her sister, who could do educational tasks forever. If your kid is bigger you can select plenty of fun activities (number recognition, puzzles, memory game) within the topic, food on the link above. Enjoy you fruit and veggies. Last year I started a hopefully long tradition: taking note of daily memories of December, the advent period, our Christmas itself, the days between holidays and New Years Eve too. Here is the last year’s post. The kids were at their grandparents and the Angels have brought us the advent calendar. This year the main theme is decorating a Christmas tree with stickers. It’s great as both girls can do it and enjoy it. Our advent “wreath” is ready. It’s evident we didn’t have much time for it this year either. Perhaps next year. In the morning we had a family photo shoot in our home. See the photo collage a little further down. When all our guests were gone E. did the washing of the cookie cutters all by herself. And we had some more fun at the dinner table. E. made sure L. can’t take out her hair clip(s). In the morning we went to buy winter boots for E. as this week it’s started to snow. We lit the first candle on our Advent wreath today. We’ve been playing with the choo-choo train nearly all afternoon. E. read The Gingerbread Man for L.
I read How the Grinch stole Christmas by Dr. Seuss to E. as a bedtime story. This was a quiet day. E. was in kindergarten and I was running errands. Little L. spent the whole day at her Grandma. We picked E. up from kindergarten together and we immediately changed into English. At home E. found an old English writing practice book and started to work on it. L. was walking around in her pretty red shoes the heels of which light up. Of course, more stickers got on our Christmas tree. In the morning Little L. and I went to the Helen Doron English session (Toddler’s Best Start is the name of our new course) which she enjoyed a lot because our new topic was vehicles (trucks, cars, trains, planes) L.’s been crazy about them lately. But the highlight of the day was the play performed by E.’s kindergarten teachers – St Nick’s glove. It was a cute and loveable show. My Mum was taking care of Little L while we were watching the play in the kindergarten. After having arrived home the kids opened some presents that St. Nicolas had brought to their grandma’s house. In the evening the girls cleaned their boots and put them out into the window waiting for St. Nick to fill them with goodies. E. was really excited. She wanted to stay up to have a look at Santa. I didn’t have to say twice to the kids to get out of bed in the morning. Within a blink of an eye they were in the living-room checking their boots. They opened their gifts with great excitement. Although we were in Hungarian, they got books, and activities in English, some toys and sweets. 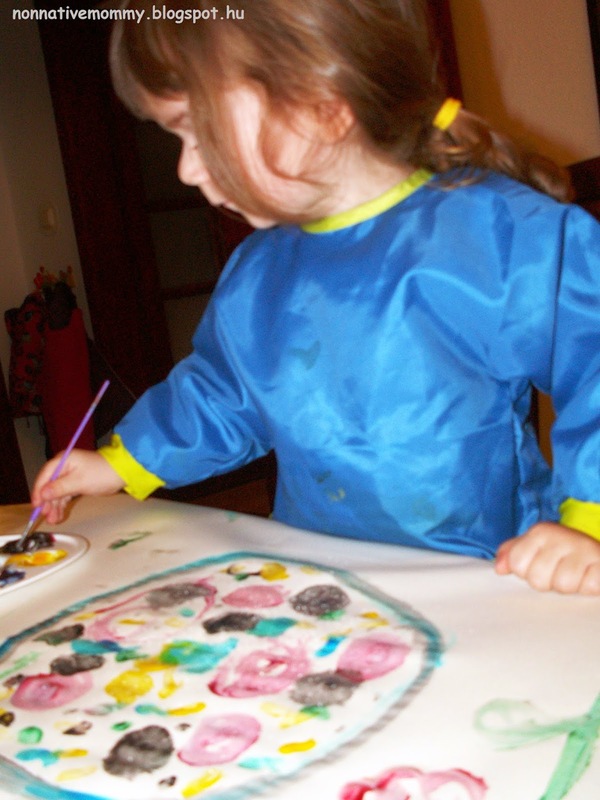 Our native nanny, N. was here in the morning and they tried to paint a magic booklet L. just got from Santa. E. met “the real Santa” (as she put it) in her kindergarten. In the afternoon Little L. met St. Nick in our main square. At first she was a little scared but then she got a candy (szaloncukor) and she kept saying she wanted to go back. We were in English but Santa and his helpers, of course, spoke Hungarian, still Little L. talked to me in English. We didn’t stay out much as it was very cold and windy. All the way home L. buried her little face in my shoulder. At home we made Santa’s beard out of cotton wool balls. 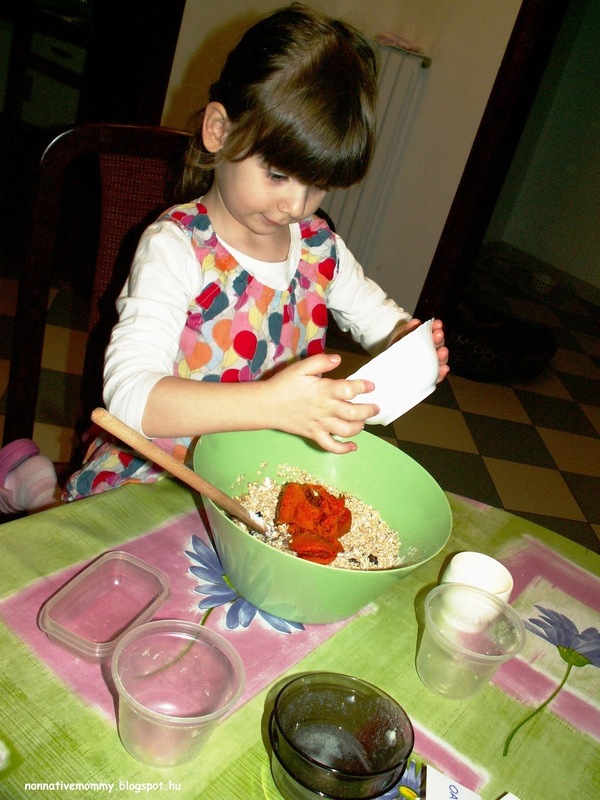 We had some healthy snacks, like raw broccoli in the market and dried cranberries at home. Our native nanny was here and E. showed her what she got from Santa. I was brave enough to give E. our paper-based Days of December album. She was cutting out some photos and I glued them in, but what she enjoyed the most was putting stickers all over the album. In the morning we went shopping with E. as she’d grown so much that all her leggings are short, her socks are too small. We were invited to our Helen Doron school to make some advent crafts. I’ve written a separate blog post on it. We lit the second candle on our advent wreath. The girls improvised dot-market painting. The end result looked like Christmas lights. The girls had been eating so much sweets all day that I made them an obstacle race field in our living room where they could burn their energies. We’ve started to prepare some Christmas presents and cards with E.
We received our Christmas photos. They turned out pretty well. Our Advent Christmas tree is getting nicer and nicer with all kinds of stickers. Gingerbread party in the kindergarten. L. is a little snotty so she didn’t come but enjoyed the company of her grandma and grandpa. We could spend the day together with E. in her kindergarten. What she enjoyed the most was she could show me her favourite toys and we could play together both inside and outside, in the playground. After lunch we came home and took a nap. Next we prepared some Christmas baubles we’ll give to her teachers and friends. Last Helen Doron lessons of this year for the girls. Little L. surprised her teacher, Z., with Christmas presents (a Christmassy pen and a Christmas card that we’d made with her hand-and fingerprint) and she said Merry Christmas in the morning. E. gave her Christmas present to Zs. (her Helen Doron teacher) in the afternoon after her lesson. It was a Christmassy pen, the green-yellow bauble we’d made the day before and her hand Christmas tree card. She wrote Merry Christmas inside. Zs. sent me how her bauble looks on her Christmas tree. In the afternoon we went on to make some more Christmas presents. 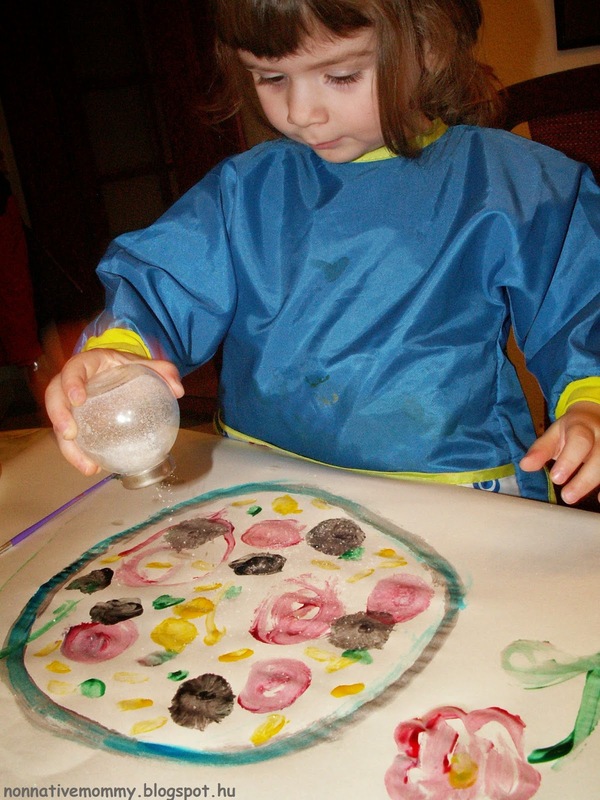 With Little L. we made Christmas tree decorations out of air-dry clay and sequins. With E. we made a clay hand-shaped , which I’d been planning to make for a long time but we didn’t have the time for it (see the source and step-by-step instructions of the idea on the link above). Our English-speaking friends visited us. In the morning my friend, B., who speaks only English to the girls, came over and played with E. and L.. She also stayed for lunch too. The kids were excited and a little ill so the whole morning was chaotic and tense. Still, we survived and spent the morning in the company of a much-loved friend. and the girls also got a really pretty Christmas card with N.’s poem written directly to E. and L. How sweet is that? I was lucky enough to buy white and silver lackmarker with which I’ll be able to decorate out Days of December album. L. was really early bird, got up at 5, I managed to keep her quiet and in bed for an hour, hoping for her falling back to sleep but she didn’t. So we started cooking together. She woke up talking to me English. What a nice start, only if it had been at about 8. What’s more, we found some self-adhesive earrings. The girls got all pretty when they went to the library with their Dad. In the afternoon we went out to buy infrared heat lamp as we are not getting better as for our health. And of course, we just couldn’t miss out on the choo-choo train in the shopping mall. Late at night I put together the yearly photo book gift for the grandparents. Literally, nothing happened today apart from lighting the 3rd candle. Well, it not totally true. In the afternoon I went to meet my friends. A little bit of me time is a big thing around here. We went on creating more Christmas gifts, like this pine cone Christmas tree. Two small snow globes were waiting for the girls in the advent calendar. We read Maisy makes gingerbread about 15-20 times. Little L. loooooves it. In the morning we “had to” make some more gingerbread. It was a family project. In the making Daddy needed to read Maisy makes gignerbread a few time. L. matched her rolling pin to Maisy’s. As E. is into the periodic table again (I’ve already written a few words about her craze for the chemical elements in the post when she celebrated her 5th birthday) she and Daddy made the letters for the elements and Little L. and I were making more Christmassy gingerbread. Today was the Christmas party in the kindergarten. We just went to give the presents to E.’s kindergarten teachers. We didn’t stay for the party due to our viral illness. We also met E.’s best friend and gave her our Christmas present too. She also got some surprises for E. They played a little outside but it was terrible cold so we soon said our good-byes. As we got home we finished the ring holder presents for grandmas and prepared our door wreath. The girls used their second waterbomb at bath time. The angels decorated the bedrooms with lights and window decor while the girls were away. Our cleaning lady was here today and we gave her our Christmas present. The girls got 2 beautiful baubles from her. E. is into the periodic table again. We were listening to it all day instead of Christmas music. In the evening we finished the Christmas candies with E. We dipped them into hot chocolate and put them in the fridge. There are 50 of them altogether. In the meantime L. was riding on Daddy’s back. Our mistletoe is hung finally, and there’s been a lot of kissing under it. B. got here quite early, so she and E. helped me to wrap the Christmas candies. Just like my Mum. And we tested them too. Yum! In the morning we made pizza. In the afternoon Daddy took the girls to their training. While they were away I was cooking the Christmas dinner. This year there’s no fish. E. and L. like it more or less, but we’d decided that I’d cook their favourite: chicken soup, and stew with noodles. In the morning the final touches were done before Christmas Eve, cooking cleaning and decorating. The girls opened the last pocket in the advent calendar where they found the star (in 2 pieces) and stuck it on the top of our paper tree. Later we played a snowflake matching memory game we’d accidentally found. While the kids took their afternoon nap the Angels brought us our gorgeously decorated Christmas tree. Nobody could enter the living room, where the Angels were working, until the sound of their bells. While we were waiting for the jingle we made chestnut balls for dessert and got dressed in pretty clothes. Around 5 o’clock the door could be opened and the kids were amazed by the sight. The whole evening was about opening presents, playing together and having a wonderful Christmas dinner. According to E. this Christmas is not simply great but divine. She said the best present was the chemical element cards, which she immediately put out according to the periodic table. Linda loved everything she got she didn’t know what to play with suddenly. Maybe her very favourite one on Christmas Eve was the little pink scooter. We celebrated Christmas at my mother-in-law’s place. We celebrated Christmas at my Mom’s. Finally I could have a good use of my new camera. The girls’ Godparents and their kid came over in the afternoon so we could surprise one another with presents. E. went to the Helen Doron School for a one-day winter camp, where she had English sessions, arts and crafts, film watching all in English. Her favourite activity was making this bird feeder out of pine cone, peanut butter and seeds. As we don’t have a garden we hung it in the park near to our flat. LITTLE L.’S 2ND BIRTHDAY PARTY. In the morning we went to buy balloons for L. with E. We were in English and the lady in the party shop was amazed that E. understood both languages. We saw a robin, a finch and a blackbird that suddenly took wing as we were getting closer. At nap time I picked up L.’s birthday cake (dairy and egg-free chocolate cake because of E.’ diet) and decorated the flat for the afternoon birthday party. It was just for our extended family. We were playing and playing and playing in English with all the toys and games the girls received for Christmas and L’s birthday. A quiet New Year’s Eve. The girls cannot stay up until midnight so we celebrated in the evening with New Year’s Eve activity, sparklers and balloons in the bath and paper trumpets. They went to bed at about 9.30 and fell asleep immediately. I wish you all the best, loads of second language exposure, fun and happiness in 2018. This week one day there was one of the rare occasions that L. (E.’s baby sister) was not sleeping in a sling on me so I managed to put her down and I could prepare a baking activity for E. while she was at the nursery. As E. is familiar with the alphabet (check out this post on the alphabet activities and other ABC posts) and quite a lot of sight words (I haven’t written about it separately but I should) and E. has been handling picture and story books since she was born, it is no problem for her to recognise/read certain words. I wanted to expand her knowledge of recognising words in a fun way. 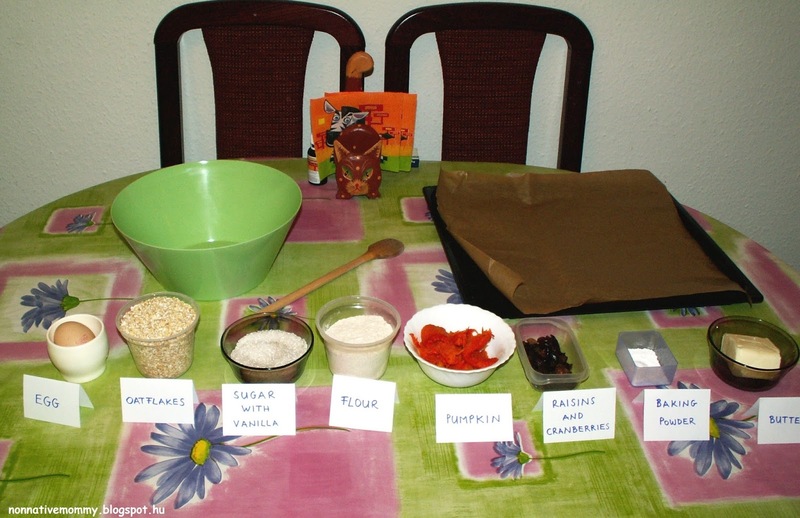 I prepared everything beforehand (maybe next time it’ll be a measuring activity, when SHE can prepare all the ingredients). 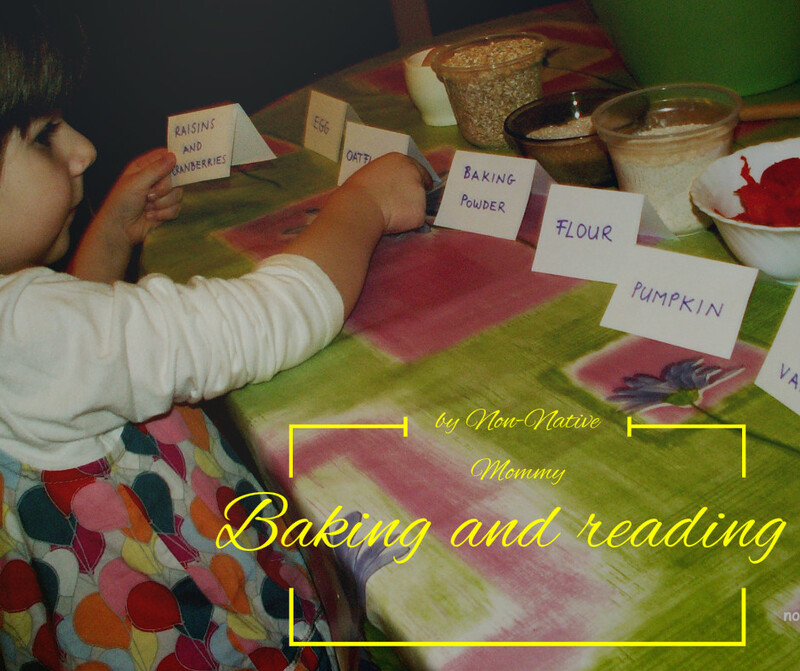 I made little cards for her to read and I placed them in front of each bowl. The twist was I mixed them up before she started the activity. First, she needed to swap the cards around to place them in front of the right bowl. 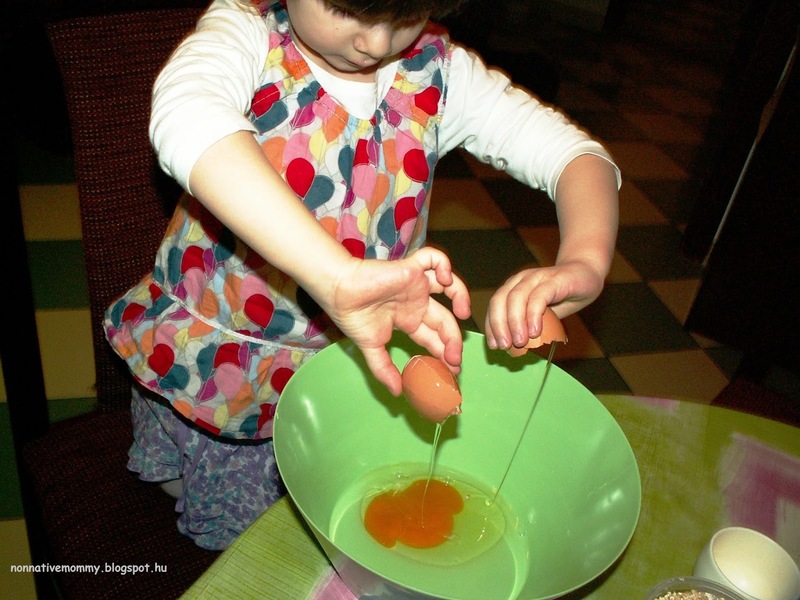 After that she cracked the egg. Then the mixing could start. She added everything in a big bowl. I asked her to report me what she was doing as in a cooking show. – I’m putting the flour in. – Now comes the butter. After all this, I made little balls out of the mixture (she doesn’t like to dirty her hands) and placed them on a tray covered with baking paper. Finally, I managed to convince her to flatten the balls with her fingers and palm. 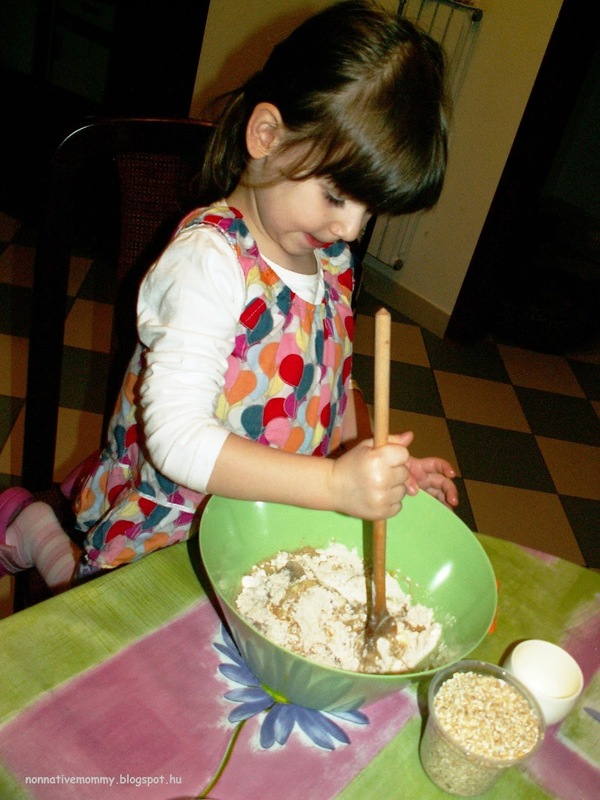 Do you cook or bake with your little one(s)? Let me know what in the comments. E. is quite excited every time she can spend some time in the kitchen with me. For me it’s rather a challenge and I need to be extra relaxed, plus in a good mood to shoulder all the mess and fuss around it. Whenever I pull myself together and dare to enter the kitchen with a 2,5 year old hurricane to do some cooking or baking projects, it’s always fun and the result is fantastic, though. 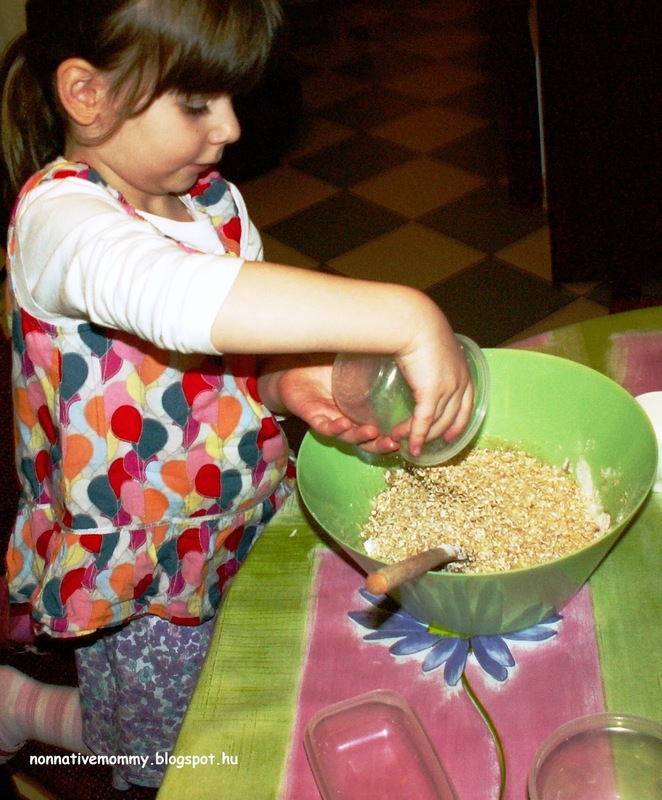 Cooking and baking together together with your child/children always gives you a great chance to learn and practice new things. 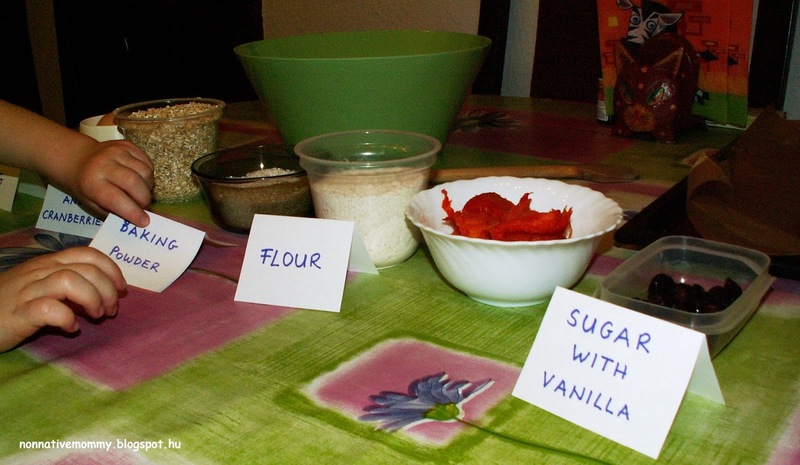 Not only kitchen activities like whisking, stiring and pouring but also your second language. 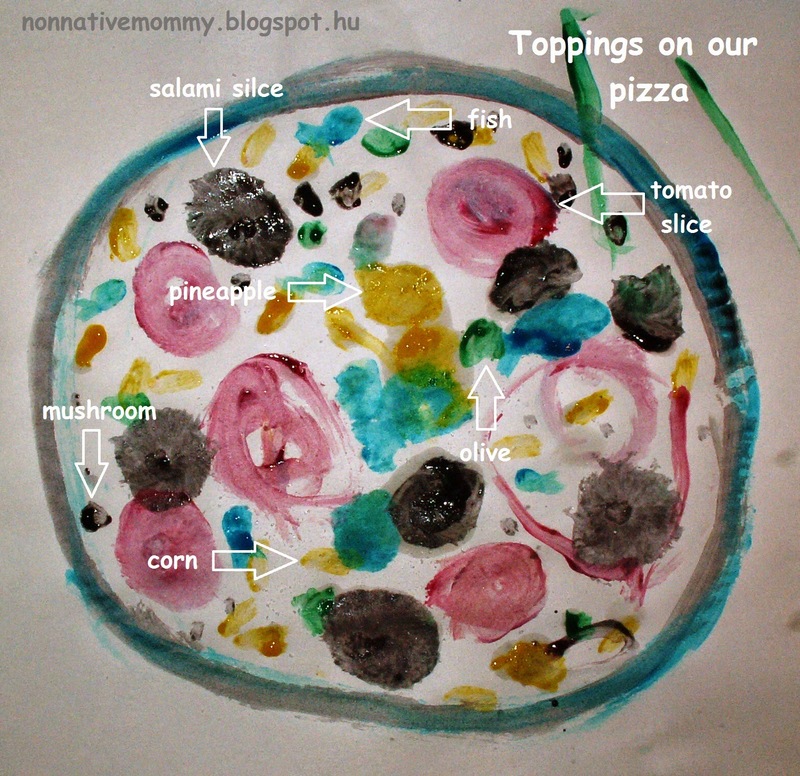 This is what we did a few months ago when E. made her first pizza. Today I wasn’t prepared for the kitchen mess so I only entered into the spirit of painting. The kitchen stayed clutter- and mess-free and we were all happy.